Courtesy of Just Selling AZ. CUSTOM built home w/insulating concrete foam construction = 6” concrete walls plus 5” of foam insulation for low utility bills. 1500 sq ft HEATED/COOLED SHOP w/3 PHASE POWER, 3” INSULATED foam walls, 3 ROLL UP doors & 750 sq ft semi-enclosed RV garage & Domestic water well w/views of the Superstition & Goldfield Mountains. Upgrades include 6” thermal mass INSULATED stained concrete flooring, Stone Creek CUSTOM, BUILT-IN living room entertainment center & desk & book cases in Den, recessed LED lighting & ceiling fans thru out, 36” doorways & Knotty Hickory cabinets in kitchen & baths. Kitchen includes ISLAND w/Electric cook top & seating for 2, CUSTOM vent over Island, WALL OVEN, Microwave, views & huge WALK-IN PANTRY w/shelving. EXTENDED 26X28 attached garage w/10′ double doors. Directions: From US 60 head north on Idaho Rd apx 5 miles. Take a right on McKellips Blvd. Left on Wolverine Pass Rd. Home is on the right. Approximate size: 108900.00 sq. ft. Please, send me more information on this property: MLS# 5877416 – $675,000 – 4173 N Wolverine Pass Road, Apache Junction, AZ 85119. 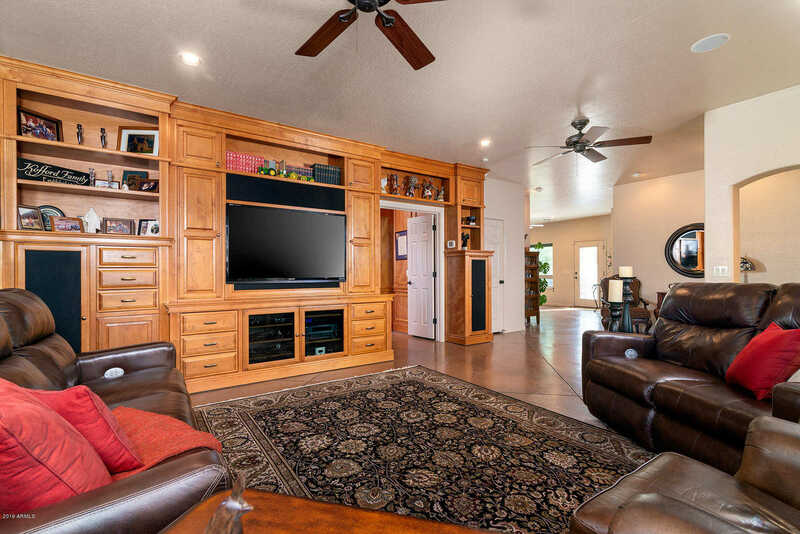 I would like to schedule a private showing for this property: MLS# 5877416 – $675,000 – 4173 N Wolverine Pass Road, Apache Junction, AZ 85119.